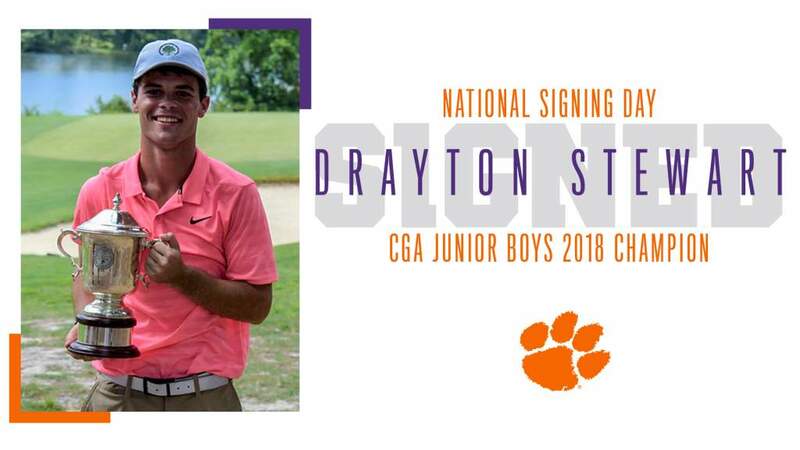 Clemson, SC—Clemson Head Golf Coach has announced that Drayton Stewart and Carter Pendley have each signed a national letter of intent with the Tigers program. Stewart comes to Clemson from Charleston, S.C. and Pendley from Dalton, GA.
Stewart is in his senior year at James Island Charter High School in Charleston, who committed to Clemson in the Spring of 2016. He won the CGA Junior Boys Championship in 2018 and finished third at the South Carolina Junior Match Play. Stewart also has a pair of top four finishes at the Junior Azalea, third in 2016 and fourth in 2018, and has finished in the top eight of the South Carolina Junior Golf Championship three of the last four years. 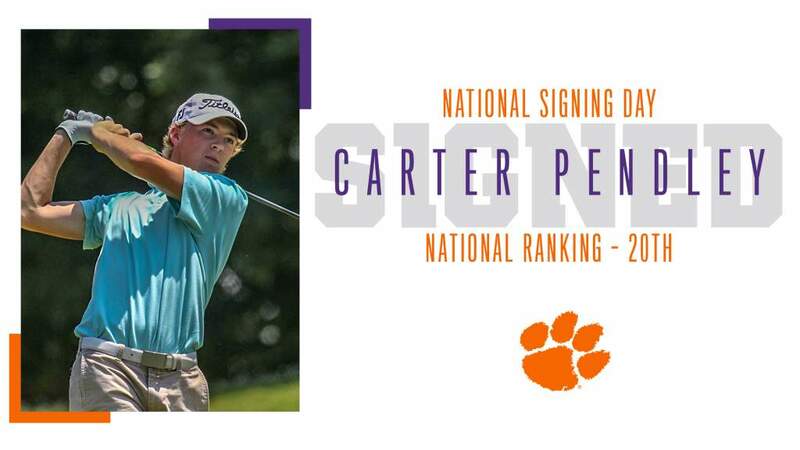 He also had a top five finish at the Carolinas Junior Championship in 2016, the Charles Tilghman PGA in 2017 and the Jimmy Self Invitational in 2018. Stewart is the grandson of former Clemson baseball All-American and 11-year Major Leaguer Ty Cline, a member of the Clemson Hall of Fame. His father Danny Stewart is a teaching professional at the Country Club of Charleston and his sister Callie Stewart is a junior at Clemson. According to Golfweek, Pendley is the No. 3 ranked player in Georgia and is 26th in the nation in the class of 2019. Junior Golf Scoreboard ranks him No. 2 in the state of Georgia and No. 20 in the class of 2019. Pendley has finished in the top seven of the Georgia High School Championships each of the last two years, seventh in 2017 and third in 2018. In 2017 he finished in the top three of three AJGA events. He was second at the AJGA of London and the Big I National Championship and was third at the AJGA Billy Horschel. In 2018 he won the AJGA Junior at River Watch, was second at the Big I National Championship and 15th at the Wyndham Invitational.